Hi, I'm Jonathan Smith. I was born right here in Durango, Colorado and grew up with the small town atmosphere. Now, the thought of living in a big city is terrifying... From almost the minute I was born, I was surrounded by the quiet yet busy feeling of the small mountain town I would call my home. A love of the mountains and fresh air was planted in me, and the mountains have now become almost like a part of my family. From almost the minute I was born, I heard the echo of a steam engine whistle blowing outside my door. It was a sound that would soon carry me into one of the greatest adventures of my young life. 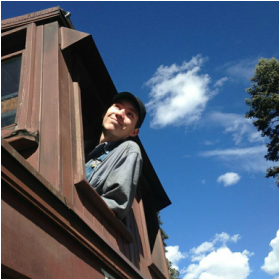 The Durango and Silverton Narrow Gauge Railroad ran steps from my house, and so a love of trains and history was thrusted to me. I now have the incredible opportunity to work for the Durango and Silverton. I get to share my love of the train with over 200,000 passengers every year. Why Did I Choose Animas High School? From the minute we started my very first project in elementary school. I knew that projects were the way I needed to learn in the future. In middle school, I started at a, normal, regular, run of the mill school that taught in the traditional style. However, my math teacher took the class a step further and finished each lesson with a project. I then went to the brand new charter school, Mountain Middle School because of their emphasis on project-based learning. Over those two years, I developed a love for learning through projects. Through projects, I am able to take what I learned, and make it understandable to me through creative expression. Because I got used to Mountain Middle Schools style of learning, I decided that Animas would be a good fit. Also throughout school, I have had issues with bullies, and schools that don’t have a very safe culture that anyone should be learning in. Even at Mountain Middle School, things did not go well for me socially. I have heard, and now experienced, that Animas High School IS a safe place, and that all of the students care about not only the school they’re in, but the people that they go to school with. I feel very safe and respected here, and I think that I will thrive this year and the rest of my four years at Animas High School. "My heart is warm with the friends I'll make, and better I'll not be knowing. Yet there isn't a train I wouldn't take, no matter where it's going."